With the number of mental health issues among American service members rising at unprecedented levels, mental health professionals trained to work with veterans, active duty personnel, and their families are more in demand now than ever before. 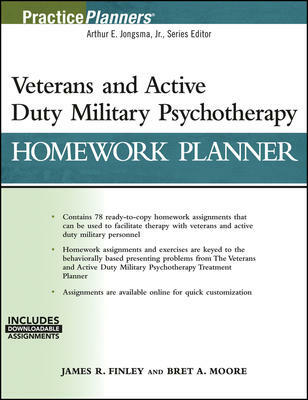 Drawing from the authors' extensive experience treating veterans, this book provides an array of ready-to-use assignments tailored to address the needs of these individuals, including combat and operational stress reaction, post-deployment reintegration, attention and concentration deficits, PTSD, and depression. This is an invaluable resource for mental health providers treating this patient population.